Oakland, CA—In advance of the release of the World Bank’s 2019 Enabling the Business of Agriculture (EBA) report, the Oakland Institute’s scathing exposé reveals the Bank’s new scheme to privatize land in the developing world. 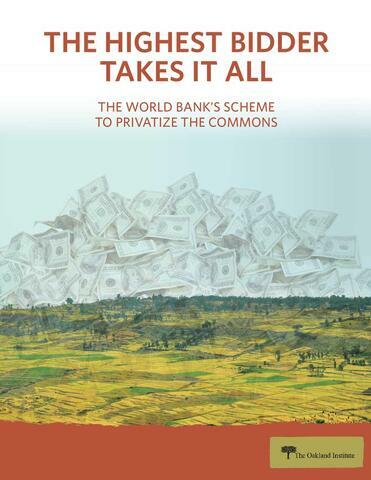 The Highest Bidder Takes It All: The World Bank’s Scheme to Privatize the Commons details how the Bank’s prescribes reforms, via a new land indicator in the Enabling the Business of Agriculture (EBA) project, promotes large-scale land acquisitions and the expansion of agribusinesses in the developing world. This new indicator is now a key element of the larger EBA project, which dictates pro-business reforms that governments should conduct in the agricultural sector. Initiated as a pilot in 38 countries in 2017, the land indicator is expected to be expanded to 80 countries in 2019. The project is funded by the US and UK governments and the Bill and Melinda Gates Foundation. The EBA’s main recommendations to governments include formalizing private property rights, easing the sale and lease of land for commercial use, systematizing the sale of public land by auction to the highest bidder, and improving procedures for expropriation. Countries are scored on how well they implement the Bank’s policy advice. The scores then help determine the volume of aid money and foreign investment they receive. “The Bank claims that this indicator will protect land rights and bring more freedom and equity in terms of access to land, but it is actually an unprecedented push to privatize public land and facilitate private interests’ access to the commons, to the detriment of millions around the world,” explained Frédéric Mousseau, Policy Director at the Oakland Institute and author of the report. Amidst myriad flaws detailed in the report is the Bank’s prescription to developing countries’ governments, particularly in Africa, to transfer public lands with “potential economic value” to private, commercial use, so that the land can be put to its supposed “best use.” Claiming that low-income countries do not manage public land in an effective manner, the Bank pushes for the privatization of public land as the way forward. This ignores the fact that millions of rural poor live and work on these lands, which are essential for their livelihoods while representing ancestral assets with deep social and cultural significance. "It appears that this new land indicator aims to stimulate large-scale industrial agriculture, which risks opening the way to more land concentration and land grabbing, degradation of natural resources and deforestation," reacted Ibrahima Coulibaly, President of the West African peasant organization ROPPA and President of the National Coordination of Peasant Organizations (CNOP) in Mali. "Africa is plagued by food insecurity resulting from inconsistent policies and faces the consequences of the climate crisis. Our governments need to be encouraged to develop coherent agricultural policies that support family farmers and secure their land rights. This will ensure resilient ecosystems and prosperous local economies, and therefore peace and stability, much needed in the continent." The Highest Bidder Takes It All is released as part of the Our Land Our Business campaign, made up of 280 organizations worldwide, demanding an end to the Enabling Business of Agriculture program.